Hypothesis: Improvements in aerobic capacity and injury recovery might be achieved by nutritional strategies specifically targeted at improving mitochondrial function by both enhancing mitochondrial biogenesis and recycling dysfunctional proteins by autophagy. Endurance performance is closely predicted by oxygen consumption at the anaerobic (or lactate) threshold (VO2LT) and VO2LT is proportional to muscle mitochondrial volume. The evidence for mitochondrial function being the performance limiting factor at or above the anaerobic threshold is that lactate is generated from exercising muscle in spite of adequate blood supply and oxygen availability and therefore “anaerobic threshold” is something of a misnomer and Lactate Threshold (LT) would be a more accurate term. Lactate is generated due to rapid increase in ADP/ATP ratio from working muscle. The increased ADP levels must be converted to ATP within mitochondria by the ATP synthase protein complex associated with the Electron Transport Chain and no matter how much oxygen is being transported to the muscle conversion of ADP to ATP is limited by the amount of functioning ATP synthase molecules in the exercising muscle. Experience athletes will be very familiar with how much effort and work rate they can sustain at and above their LT as exceeding LT for brief periods during endurance performance quickly leads to hyperventilation and exhaustion. While VO2max is vitally important to athletic ability it is a relatively stable attribute of athletes, however VO2LT and the ratio of VO2LT/VO2max are better indicators of ability in endurance sports (1) and is also more responsive to training. VO2LT is essentially maximum sustainable Aerobic Enzyme Activity and is dependent on mitochondria number and enzyme density. Muscle biopsy studies in humans have shown mitochondria are highly responsive to exercise and can increase with 6-8 weeks of training and decrease within 6-8 weeks of detraining (2). Peroxisome proliferator-activated receptor γ coactivator 1α (PGC-1α) is the master controller of mitochondrial biogenesis and is in turn controlled by both physical activity and nutrition (3). Attempts at improving athletic performance in humans and animals through various dietary modifications have been tried before with varying results. Traditionally high carbohydrates were in vogue but more recently attempts at stimulating fat metabolism in order to spare glycogen stores have been tried. In summary low carbohydrate/high fat interventions over several weeks, were more effective than interventions over days and tests of endurance were improved more than tests of sprints, but it is fair to say that there have been few if any deteriorations in endurance performance in studies on high fat diets as long as sufficient time for adaptation was allowed (4). There have been no studies with the specific goal of monitoring VO2LT, the physiological parameter that is closely linked to mitochondrial biogenesis. Two recent studies document greater mitochondrial enzyme enhancement while training in fasted (2) and glucose withheld conditions (5) but with no dietary change between training sessions. The most up to date review by the Australian group (4) used short term high fat diets that still had substantial carbohydrate content and therefore were unlikely to create conditions for enhanced mitochondrial biogenesis. “Train Low perform High” This catch phrase has been used to guide the concept of fat enhancement during training, the idea is to train on a low carb/ketogenic diet and high carb load only 24 hours or so before a competitive event. The suggested diet for individual athletes to be test should be enjoyable and encompass most of what is already known to be beneficial but with a strict avoidance of hyperglycemia inducing a mild ketogenic state by replacing high glycemic carbohydrates with plant foods high in fiber water and phytonutrients. Protein of not more than 2 gm/kg/day from meat, fish, poultry, eggs, dairy and the bulk of food consumed from unlimited amounts of fruits, nuts, vegetables, salads, oils and dressings with lots of herbs and spices. In this way relatively large and satisfying meals would supply the majority of calories from slowly digested carbohydrates, fats, oils and short chain fatty acids from prebiotic fiber fermentation. Carbohydrate restoration for competitive events can be achieved by increasing carbohydrate intake 1 day prior to competition in order to increase muscle glycogen content. Improvement should not be expected in less than 4 weeks, neither should significant performance improvement occur during training because muscle glycogen will be depleted on a ketogenic diet, however muscle proteins that generate energy from fat oxidation should gradually increase ultimately resulting in glycogen sparing and greater endurance performance. Hyperglycemia and insulin suppress PGC1 by Akt/PKB removing fox01 from the PGC1 promoter. Glucose produces ATP & NADH through extra-mitochondrial glycolysis; decreases cytosol NAD+ inhibits SIRT1 which activates PGC1 through deacetylation Fig 2. A mild ketogenic state brought about by low dietary glucose availability increases PGC1, via glucagon action and direct effects of changes in free fatty acid levels (FFA) and ketone bodies on nuclear gene transcription. Insulin profoundly suppresses FFAs which are ligands for several transcription factors (PPARs & Free Fatty Acid Receptors) that interact with PGC1 in the promotion of mitochondrial protein synthesis. Mitochondria are constantly destroyed and re-synthesized with estimates in rats for half-lives in; liver, 9.3 days; testes, 12.6; heart, 17.5 and brain 24.4 days (6). Cell proteins are broken down by proteasomes (7) and whole organelles by autophagy. Mitochondrial mass is increased through biogenesis rather than decreasing mitophagy (8) which is necessary for cell maintenance as blocking autophagy accelerates apoptosis and prevents the life extension and metabolic improvements associated with calorie restriction and sirtuins. (9) (10) (11). The likely mechanisms whereby mitochondrial function is controlled through substrate and hormone levels are described in a review by Douglas Wallace (10): Very simply high glucose and insulin levels inhibit mitochondrial biogenesis while it is stimulated by glucagon, fatty acids and ketone bodies (12). There is a sea change in nuclear signaling inside cells that pivots around the abundance of glucose. Glycolysis takes place in cytosol producing higher NADH/NAD+, whereas fatty acids and ketone bodies are metabolized in mitochondria and thus increase cytosolic NAD+ which activates SIRT1, a deacetylase which counteracts the acetylation and consequent deactivation of FOXO and PGC1. The controlling effect of glucose on pancreatic secretion of either insulin or glucagon is another pathway regulating mitochondrial biogenesis through the master controller PGC1 as shown in the figure below (13). 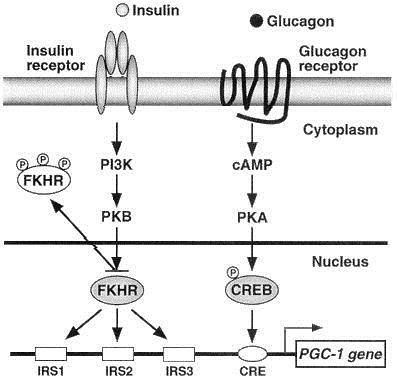 In addition the intensity of physical activity directly increases PGC1 transcription in muscle cells and increases sympathetic tone suppressing insulin and increasing glucagon pancreatic secretion, both glucagon and adrenergic receptors activate the cAMP-PKA mediated increase in PGC1 transcription (13) (14) (10). Regulation of PGC-1 Promoter Activity by Protein Kinase B and the Forkhead Transcription Factor FKHR. The Ketogenic Diet was designed in the 1920’s as a starvation mimicking diet, since starvation was known to limit seizures (15). The classical KD; high fat, very low carbohydrate, was an effective treatment for epilepsy but fell out of favor with the development of phenytoin in 1938 but has experienced a resurgence in use over the past 20 years, particularly in the treatment of refractory epilepsy (16). Less rigid versions of the classical KD have been used with equal efficacy such as the low glycemic treatment (17) and modified Atkins diet (18). Not only are seizures decreased in children with epilepsy but improvements were noted in behavior and cognitive functions (16) (19) (20). A great deal of research has gone into the mechanisms involved and widespread improvements in energy metabolism have been documented (21). Mitochondria from animals fed a ketogenic diet produced less reactive oxygen species (ROS), mitochondrial density increased and numerous proteins involved in oxidative phosphorylation increased in the hippocampus in addition to anti-apoptosis mechanisms (20). Neuroprotective effects of a KD have been reported in Parkinson’s disease and Alzheimer’s disease (20). Improvements in Autism have been reported (22) and this is not surprising given the links between Autism, ADHD and mitochondrial dysfunction (23) (24) (25). The benefits of ketogenic diets are not confined to nerve tissue similar improvements in mitochondrial function have been documented in muscle (26), heart (27) and liver (28) and there is a systemic increase in mitochondrial and antioxidant enzymes brought about by PGC1 and NRF2 (nuclear respiratory factor) (28). 1. Limiting factors for maximum oxygen oxygen uptake and determinants of endurance performance. DAVID R. BASSETT, JR. and EDWARD T. HOWLEY. No. 1, pp. 70–84, 2000, s.l. : Med. Sci. Sports Exerc., , 2000, Vols. Vol. 32, . 2. Raising plasma fatty acid concentration induces increased biogenesis of mitochondria in skeletal muscle. Pablo Garcia-Roves, Janice M. Huss, Dong-Ho Han, Chad R. Hancock, Eduardo Iglesias-Gutierrez, May Chen, and John O. Holloszy. s.l. : PNAS , 2007, Vols. June 19, 2007 vol. 104 no. 25 10709–10713. 3. Regulation of PGC-1a, a nodal regulator of mitochondrial biogenesis. Pablo J Fernandez-Marcos, and Johan Auwerx. s.l. : Am J Clin Nutr 2011;93(suppl):884S–90S. 4. Wee Kian Yeo, Andrew L. Carey, Louise Burke, Lawrence L. Spriet, and John A. Hawley. Fat adaptation in well-trained athletes: effects on cell metabolism. 5. Beneficial metabolic adaptations due to endurance exercise training in the fasted state. Karen Van Proeyen, Karolina Szlufcik, Henri Nielens, Monique Ramaekers, and Peter Hespel. s.l. : Journal of Applied PhysiologyJanuary 2011 vol. 110 no. 1 236-245. 6. The Turnover of Mitochondria in a Variety of Tissues of Young and Aged Rats. Robert Menzies and Phillip Gold. s.l. : THE JOURNAL OF BIOLOGICAL CHEMISTRY, 1971, Vols. Vol. 246, No. 8, Issue of April 25, pp. 2425-2429, 1971. 7. Oxidative Stress-Mediated Regulation of Proteasome Complexes. Charity T. Aiken1, Robyn M. Kaake1, Xiaorong Wang1, Dr. Lan Huang (lanhuang@uci.edu). s.l. : The American Society for Biochemistry and Molecular Biology, Inc., 2011, Vols. MCP Papers in Press, Published on January 31, 2011 as manuscript R110.006924. 8. Selective degradation of mitochondria by mitophagy . Insil Kim, Sara Rodriguez-Enriquez, John J. Lemasters. s.l. : Archives of Biochemistry and Biophysics , 2007, Vols. 462 (2007) 245–253. 9. Mitochondrial Biogenesis and Fragmentation as Regulators of Muscle Protein Degradation. Sandri, Vanina Romanello and Marco. DOI 10.1007/s11906-010-0157-8, s.l. : Curr Hypertens Rep, Springer Science, 2010, Vols. 12:433-439. 10. Mitochondrial Energetics and Therapeutics. Douglas Wallace, Weiwei Fan, Vincent Procaccio. s.l. : Annual Review of Pathology: Mechanisms of Disease, 2010, Vols. 5:297-348. 11. Can Autophagy promote longevity. Frank Madeo, Nektarios Tavernerakis, Guido Kroemer. 9: September 2010, s.l. : Nature Cell Biology, 2010, Vol. 12. 12. Regulation of PGC-1 Promoter Activity by Protein Kinase B and the Forkhead Transcription Factor FKHR. Daitoku, Hiroaki, et al., et al. s.l. : Diabetes. , 2003, Vols. 52(3):642-649, March 2003. 13. Regulation of PGC-1 promoter activity by protein kinase B and the Forkhead Transcription Factor FKHR. Daitoku, Hiroaki, et al., et al. s.l. : Diabetes, 2003, Vols. 52 (3): 642-649, March. 14. A Mitochondrial Paradigm of Metabolic and Degenerative Diseases, Aging and Cancer: A Dawn for Evolutionary Medicine. Wallace, Douglas C. 359, s.l. : Annu Rev Genet, 2005, Vol. 39. 15. The effect of ketonemia on the course of epilepsy. Wilder, R M. s.l. : Mayo Clinic Bull., 1921, Vol. 2: 307. 16. History of the ketogenic diet. Wheless, James W. s.l. : Epilepsia, Wiley Periodicals, 2008, Vols. 49, 3-5. 17. Efficacy, safety, and tolerability of the low glycemic index treatment in pediatric epilepsy. Muzykewicz DA, Lyczkowski DA, Memon N, Conant KD, Pfeifer HH, Thiele EA. :1118–26. doi:10.1111/j.1528-1167.2008.01959.x. PMID 19220406, s.l. : Epilepsia. , 2009, Vol. 2009 May;50(5). 18. Ketogenic diets: an update for child neurologists. Kossoff EH, Zupec-Kania BA, Rho JM. 979–88. doi:10.1177/0883073809337162. PMID 19535814, s.l. : J Child Neurol., 2009, Vol. 2009 Aug;24(8):. 19. The ketogenic diet in epilepsy. Peterman, M G. s.l. : JAMA, 1925, Vols. 84: 1979-1983. 20. The neuroprotective properties of calorie restriction, the ketogenic diet and ketone bodies. Marwan A Maalouf, Jong M Rho, Mark Mattson. s.l. : Brain Res Rev, 2009, Vols. March 59: 293-315. 21. Energy metabolism as part of the anticonvulsant mechanism of the ketogenic diet. Bough, Kristopher. s.l. : Epilepsia Wiley Periodicals, 2008, Vols. 49: 91-93. 22. Application of a ketogenic diet in children with Autistic behavior: pilot study . Evangeliou A, Vlachonikolis I, et al. s.l. : J Child Neurology, 2003, Vols. 18: 113-118. 23. Mitochondrial Dysfunction in Autism. Cecial Giulivi, Yi-Fan Zhang, Alicja Omanska-Klusek, Catherine Ross-Inta, Sarah Wong, Flora Tassone, Isaac Pessah. December 1st, 2010, 2390, s.l. : JAMA, 2010, Vol. 304. 24. Mitochondrial dysfunction in autism spectrum disorders: a systematic review and meta-analysis. Frye, DA Rossignol and RE. s.l. : Molecular Psychiatry, Macmillan Publishers Ltd, 2011, Vols. 1-25. 25. Biomarker guided interventions of clinically relevant conditions associated with Autism and ADHD. JJ Bradstreet, S Smith, M Baral, D Rossignol. 1, s.l. : Alternative Medicine Review, 2010, Vol. 15. 26. Ketogenic diet slows down mitochondrial myopathy progression in mice. Ahola-Erkkilä S, Carroll CJ, Peltola-Mjösund K, Tulkki V, Mattila I, Seppänen-Laakso T, Oresic M, Tyynismaa H, Suomalainen A. Epub 2010 Feb 17., s.l. : Hum Mol Genet., Vols. 2010 May 15;19(10):1974-84. 27. A Ketogenic Diet Increases Succinic Dehydrogenase Activity in Aging Cardiomyocytes Potential Protective Role against Apoptosis-Induced Heart Failure. Marta Balietti, a Patrizia Fattoretti,a Belinda Giorgetti,a Tiziana Casoli,a Giuseppina Di Stefano,a Moreno Solazzi, Daniela Platano, Giorgio Aicardi and Carlo Bertoni-Freddaria. 1171: 377–384 (2009)., s.l. : Ann. N.Y. Acad. Sci. . c2009 New York Academy of Sciences, 2009, Vol. Natural Compounds and Their Role in Apoptotic Cell Signaling Pathways:. doi: 10.1111/j.1749-6632.2009.04704. 28. Acute oxidative stress and systemic Nrf2 activation by the ketogenic diet. Julie B. Milder, Li-Ping Liang and Manisha Patel. 29. Taubes, Gary. Good Calories Bad Calories. New York : Alfred A Knopf, 2007. 30. When is a high fat diet not a high fat diet? Feinman, Richard D. s.l. : Nutrition and Metabolism, BioMed Central, 2005, Vol. 2:27. 31. The Garden of Eden-plant based diets, the genetic drive to conserve cholesterol and its implications for heart disease in the 21st Century. David Jenkins, Cyril Kendall, Augustine Marchie, Alexandra Jenkins, P Connelly, Peter Jones, Vladimir Vuskan. s.l. : Comparative Biochemistry and Physiology, Elsevier, 2003, Vols. Part A 136 141-151. 32. Hyperinsulinemic diseases of civilization: more than just syndrome X. Loren Cordain, Michael Eades, Mary Eades. s.l. : Comparative Biochemistry and Physiology, Elsevier, 2003, Vols. Part A 136 95-112. 33. Impairment of fat oxidation under high- vs. low-glycemic index diet occurs before the development of an obese phenotype. Isken F, Klaus S, Petzke KJ, Loddenkemper C, Pfeiffer AF, Weickert MO. s.l. : Am J Physiol Endocrinol Metab , 2010, Vols. 298: E287–E295, 2010. 34. A Ketogenic Diet Favorably Affects Serum Biomarkers for Cardiovascular Disease in Normal-Weight Men . Matthew J. Sharman, William J. Kraemer, Dawn M. Love, Neva G. Avery, Ana L. Gómez,Timothy P. Scheett and Jeff S. Volek. s.l. : J. Nutr. , 2002, Vols. 132:1879-1885, 2002. 35. Dietary Management of Type 2 Diabetes: A personal Odyssey. Frank Q Nuttall, Mary C Gannon. 2 83-94, s.l. : Journal of the American College of Nutrition, 2007, Vol. 26. 36. The effect of a Plant based low carbohydrate (ECO-Atkins) diet of body weight and blood lipid concentrations in hyperlipidemic subjects. D J A Jenkins, J M Wong, CWC Kendall, A Esfahani, T Leong, DA Faulkner, E Vidgen, KA Greaves, G Paul, W Singer. : Arch Intern Med , 2009, Vols. 169: 11 June 8, 2009 1046-1054. 37. Spanish Ketogenic Mediterranean diet: a healthy cardiovascular diet for weight loss. Joaquin Perez-Guisado, Andres Munos-Serrano, Angeles Alonso-Moraga. s.l. : Nutrition Journal BioMed Central, 2008, Vol. 7: 30. 38. The effect of a low-carbohydrate, ketogenic diet versus a low fat diet to treat type 2 diabetes. Eric C Westman, William S Yancy Jr, John C Mavropoulos, Megan Marquart and Jennifer R McDuffie: Nutrition & Metabolism , 2008, Vols. 5:36 doi:10.1186/1743-7075-5-36. 39. Carbohydrate restriction improves the features of Metabolic Syndrome: Metabolic Syndrome may be defined by the response to carbohydrate restriction. Jeff S Volek and Richard D Feinman. s.l. : Nutrition & Metabolism , 2005, Vol. 2:31. doi:10.1186/1743-7075-2-31.